Q. 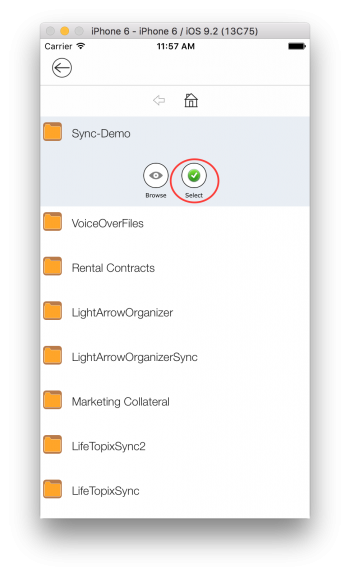 How Do I Setup Sync Between LightArrow Organizer for iOS and LightArrow Organizer for Mac? IMPORTANT: If you’re setting up sync between our iOS app and Mac app, please make sure that the sync is first setup on our iOS app. Mac sync setup should be done after the iOS sync setup. This help page applies to both LifeTopix (and other classic LightArrow apps) as well as to LightArrow Organizer for iOS and Mac. So, the screenshots and directions may vary slightly based on the app you’re using. Mac app supports only Dropbox and Google Drive for sync and backup/restore. 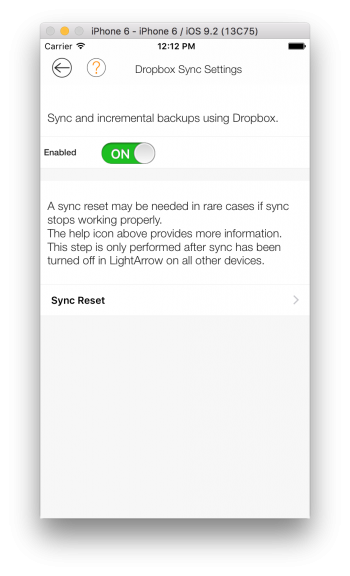 We recommend the Dropbox sync/backup option for all of our apps. For the Mac app, we also plan to support Box, OneDrive and iCloud in the future. How do I Troubleshoot my Sync Setup? 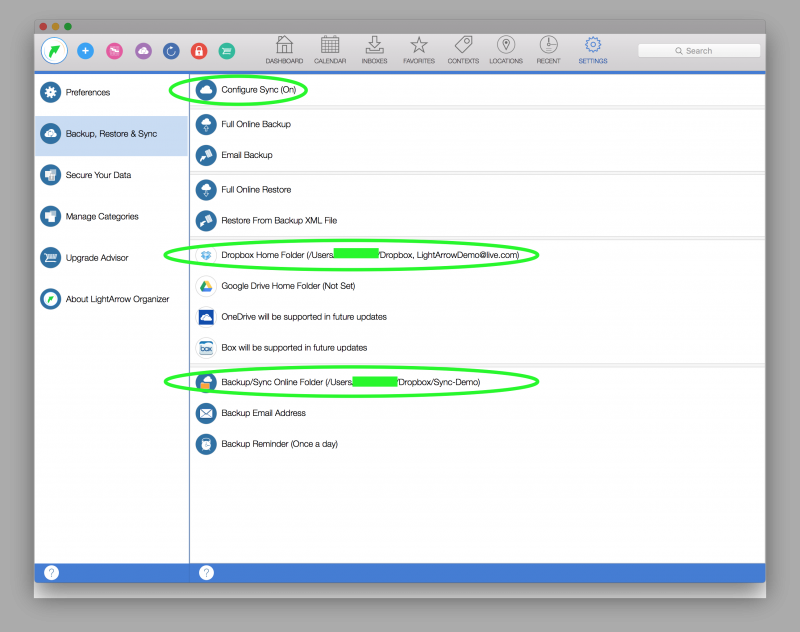 This page describes the LightArrow sync setup between the LightArrow Organizer for iOS and the LightArrow Organizer for Mac. 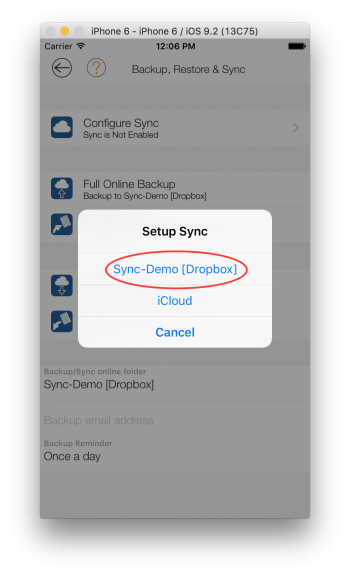 This example uses Dropbox (which is our recommended sync option) for syncing your data and files between iOS and Mac. The same procedure can be used for Google Drive as well. Select Dropbox Cloud vendor, Enter the Dropbox login email address and Sign in. 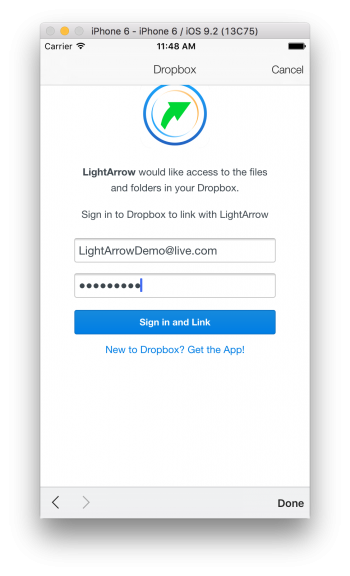 If you have the Dropbox app installed, you’ll be navigated to the Dropbox app and a prompt requests you to authorize LightArrow iOS app to access Dropbox. After you approve the request, you’ll be navigated back to our app. 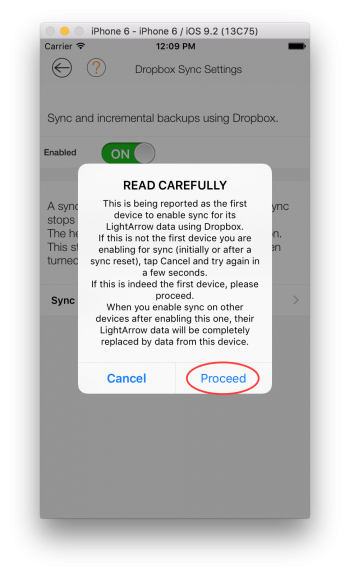 If you do not have the Dropbox iOS app installed, you’ll see the following screen. You can either choose to use the home folder of the Dropbox account or choose to use a sub folder under Dropbox home folder. 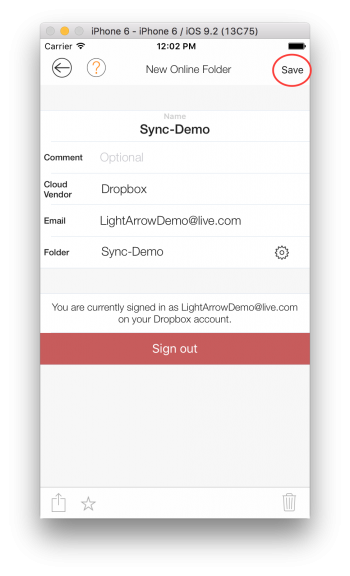 If you just tap on save on the above screen, you will sync LightArrow Organizer for iOS to the home folder of Dropbox. 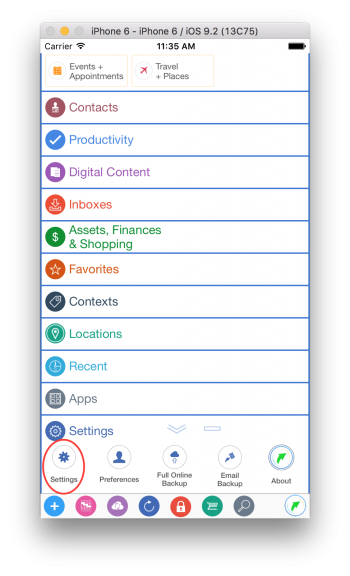 Our app will create a LifeTopixSync folder (under Dropbox home) and use that folder for sync. You can alternatively use a sub folder in Dropbox home or go deeper using the gear icon in the above screen. The above screen shows the folders and tapping on the “Sync-Demo” reveals the “Select” button and tapping on that Select button results in the selection of that online folder for the backup/sync folder. If this is not the first device (if this online folder was already used for sync before), you’ll see a different message that tells you that the data on this device is going to be replaced by the data that is currently synced with this folder. 1. Download and install the Dropbox Mac app (https://www.dropbox.com/download?plat=mac) on your Mac. 2. 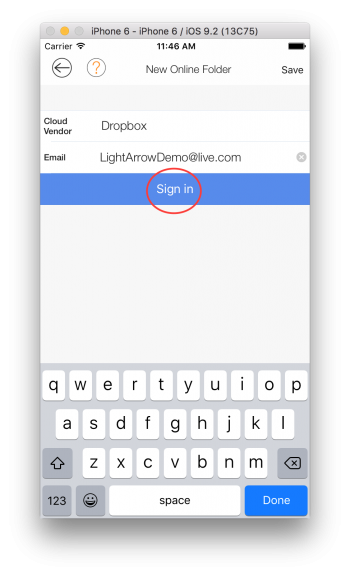 Login to the Dropbox Mac app with the same login used above in the iOS sync setup. The Dropbox Mac app should be always running (in the background) for the Mac sync to work. 4. Open the LightArrow Organizer for Mac app and go to Settings > Backup, Restore & Sync. a. Click on the Dropbox Home Folder and select the ~/Dropbox folder. This will require you to enter the Dropbox login and then takes you to a Dropbox login screen, if necessary. After you login successfully, the Dropbox Home folder is set. See screenshot below. 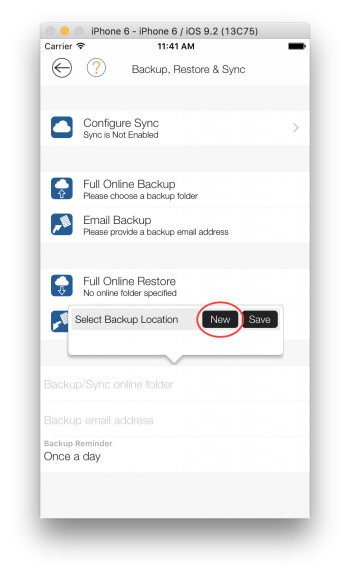 b. Click on the Backup/Sync Online Folder and select the folder selected in the iOS step (either the Dropbox Home folder or the sub folder). See screenshots below. c. Click on “Configure Sync”. 5. In the “Configure Sync” view, enable the Sync and follow the prompts. 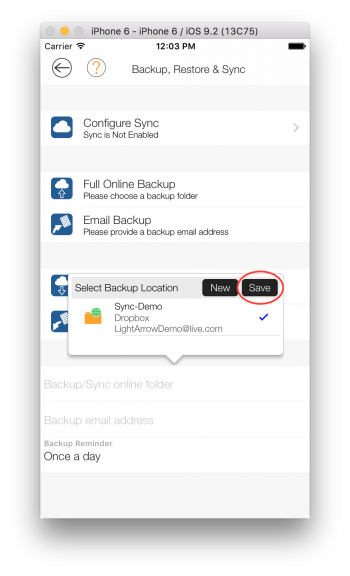 Please see the screenshots below to see how the Dropbox Home and Backup/Sync folders are selected. 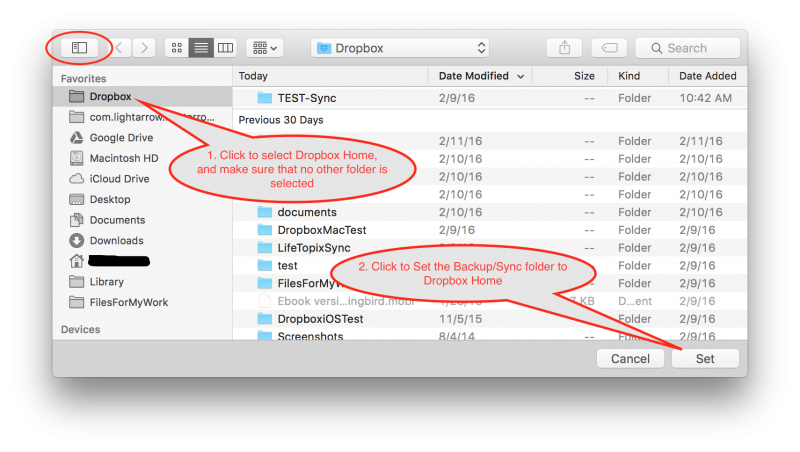 In most cases, choose the Dropbox Home folder as the Backup/Sync online folder, as shown below, especially if you have selected the Dropbox home folder on the iOS side as well. 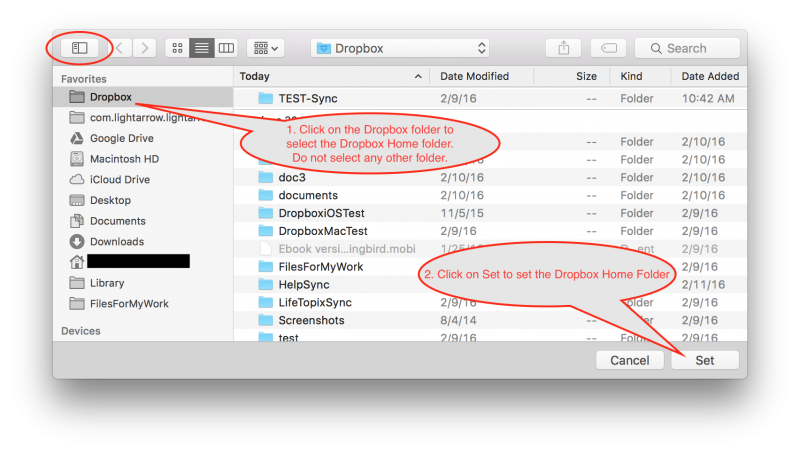 Pay no regard to the LifetopixSync folder if you see it – ignore it, don’t choose it – that is a folder our app creates under whatever Dropbox folder you would have chosen. Like we mentioned, in most cases, it is the Dropbox home folder itself. 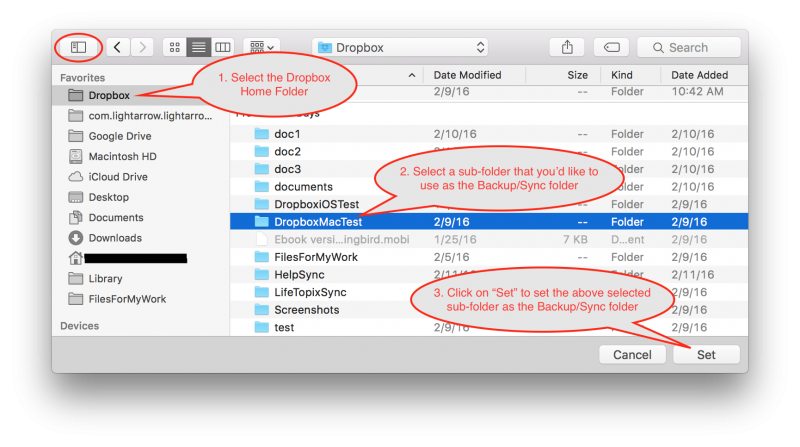 In rare cases, some some users may have selected to use a subfolder under Dropbox, such as Apps, or Backups, or something like that – when they set up the backup folder on iOS. Only in that case, please choose the same sub-folder (in Dropbox) as the Backup/Sync online folder, as shown below. Again, DO NOT select the LifeTopixSync folder. NOTE: Similar steps are necessary for setting up Backup/Sync with Google Drive.